15 sec. 15 sec. 15 sec. 15 sec. 15 sec. A top five-star hotel, the leading business-convention, incentive and resort hotel of the Kvarner region. The hotel is ideal for vacation but also for bussines people, it is placed in the center of town Opatija, not to fare away are city of Rijeka and Pula as well. Your hotel is only one and a half hour from capital of Croatia- Zagreb. Villa Roses is located in Icici-Opatija. With only 250 meters from the sea shore it is one of the most beautiful villas in the neighborhood. The villa is known as a long-time home of the Viennese doctor and scientist Julius Glax. He is surely the most important person responsible for the development of medical tourism in Opatija. Born in Vienna in 1846, he found his ideal home in Opatija, remaining faithful to the locality until death. The hotel has 26 comfortable, air-conditioned rooms of superior category, decorated to form a perfect combination of past and present in the romantic edifice of this villa. The Hotel Astoria was built in 1904. At that time the hotel, with the euphonious name “Villa Louise”, was distinguished in Austrian-Mediterranean style. The luxurious 4-star Hotel Bristol was built in 1906. The elegant hotel is situated in the centre of Opatija, only a few steps from the sea. Recently renovated, the Hotel Bristol continues to glow with its imperial charm, perfectly fitting into the spirit of the city of Opatija. The hotel’s architecture reflects its former imperial glory. The magnificent details of the facade and moldings, wrought-iron balcony and large windows are just one part of the beauty that distinguishes this splendid hotel. Located along the seaside promenade in the centre of Opatija, the Hotel Admiral provides all the facilities for an active and enjoyable holiday. The rich choice on offer will satisfy even the most demanding of guests who expect far more from their holiday than just resting or relaxing in nature. Business visitors and companies too will find here extensive facilities to support their work, as well as excellent opportunities for relaxation. The Grand Hotel Adriatic in Opatija is located very close to the town centre, above the famous coastal walking path, the Lungomare, and from it extends a beautiful view over the Kvarner Bay. Under one roof excellent accommodation can be found in superior (4*) and standard (3*) rooms, relaxation and entertainment at the attractive health and beauty centre or in the Casino, there is also an excellent gastronomic offer as well as a very successful history of organising demanding congresses and meetings. The amazing story of this villa, began in 1890. Lying by the sea,nestled in teh Mediterranean and exotic vegetation of Opatija's parks, Villa Amalia bacame one of the winter health resorts preffered by the Austrian-Hungarian nobility. Located in the centre of Lovran, halfway between the Excelsior and Bristol hotels, surrounded by apark that stretches all the way to the Lungomare seafront promenade. A villa with private swimming pool, sunbathing area and park. Located in the centre of Lovran, next to the Hotel Bristol, surrounded by a park that stretches all the way to the Lungomare seafront promenade. An intimate and charming property with a whirlpool and sunbathing area right by the sea. Villa Chiara is a family house placed in a small seaside holiday resort Ičići ( Opatija)atquiet position. It has big terrase with marvelous seaview of the Kvarner's Bay and Island Krk and Cres. This property is 1 minute walk from the beach. Located in Opatija, 200 m from the Angiolina Park, Hotel Continental is housed in an Austro-Hungarian villa built in 1898. The nearest beach is 200 m away. Once upon a time Volosko was a small fishermen village. Today is a part of famous turistic place Opatija. The apartments Dlnka are newly built, with beautiful view to Kvarner bay. Delicacies from the beautiful blue-green world that is surrounding us, you can find at Draga di Lovrana. We are situated in the Učka Nature park with a unique view of Kvarner bay. Beside our gourmet cuisine we also offer quiet and comfortable accommodation in our rooms and suite with an open fireplace, jacuzzi and sauna. In the centre of Lovran, surrounded by a garden, the Villa Elsa is located opposite the Hotel Bristol. This villa exudes a sophisticated, warm atmosphere and is particularly popular among lovers of this region. From one side hidden in the green, from the other side completely open to the sea, this hotel is characterized by rich elegance and the discreet luxury of its facilities. And as the clear water of the swimming pool reflects shimmering lights by night, it becomes obvious why Excelsior is the right name for this hotel. The private Villa Florida is the place which harmoniously combines the historical beauty and the modern times. It was built exactly one hundred years ago by E. Schody – the architect from Vienna. The Villa was completely restored in 2007, but outside it retained most of its centennial shine, colored with nostalgia, and inside it is equipped with everything we expect from the modern surroundings. The Villa is situated exactly on the coast, in Ičići, the pearl of the Opatija Riviera. In front of the Villa passes the famous 12 km promenade „lungo mare“. The Remisens Hotel Giorgio II is a completely new 4-star hotel in Ičići that belongs to the Remisens Hotels brand. It's located in quiet green surroundings above the Lungomare coastal promenade close to Opatija, and represents an excellent choice for a family holiday. 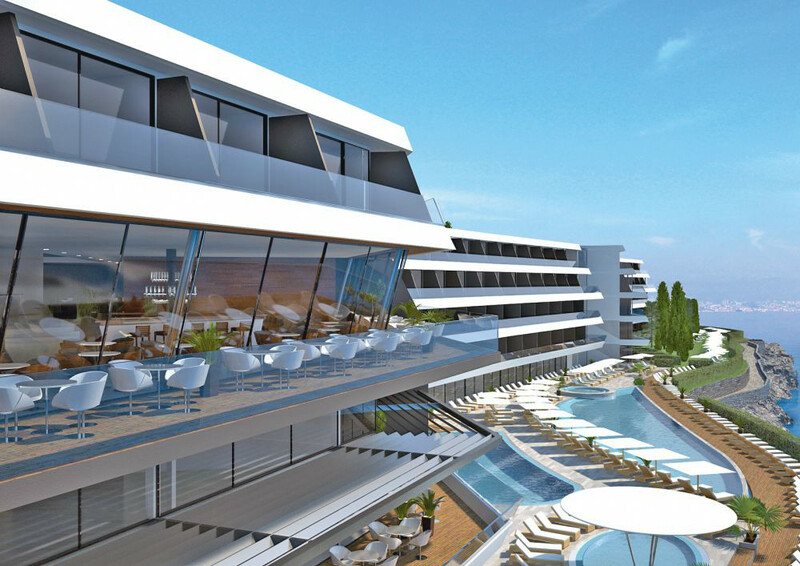 This modern 5-storey hotel has 180 rooms with balconies and an irresistible view of the blue Bay of Kvarner. For families with children, the hotel offers family rooms with connecting doors and amenities to suit their specific needs. The Best Western Jadran is is a 4-star hotel situated on a beautiful sea coast just 1 km away from Rijeka town center. 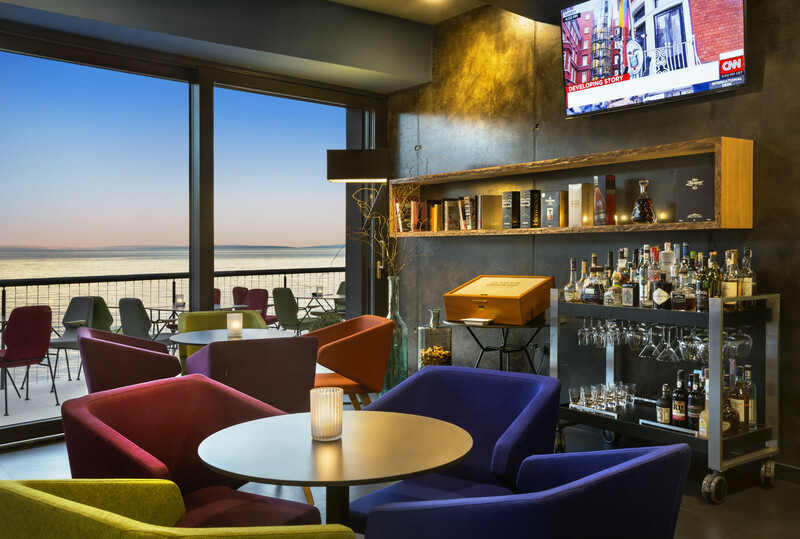 Because of the sea side location of the hotel you will have an impression that the sea is an integral part of it, influencing the overall atmosphere in the hotel by changing its colours and mood. This is the hotel with long and interesting tradition and has been reopened in December 2005 after thorough reconstruction. 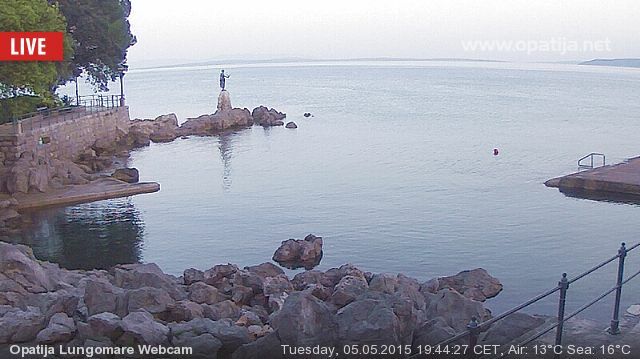 Right by the sea, on the Opatija Lungomare Promenade, in the close vicinity of the town center, main Opatija beach. Hotel & Restaurant Kukuriku is located on Lokvina, the quiet main town square in the heart of Kastav. Kastav is situated on the northern Croatian Adriatic coast, the northernmost part of the Kvarner Bay, just 10 km west of Rijeka and 6 km north of Opatija. The oldest Croatian hotel on the Adriatic. Former destination of the Austro-Hungarian monarchy emperors. Right by the sea. Villa Maria is situated in an attractive part of the city in the vicinity of the center of the town. The rich vegetation and lush greenery provide a special atmosphere and keep guests away from noise and everyday life. Thanks to the mild Mediterranean climate it is possible to enjoy a perfect holiday and have pleasure all year round. Following complete renovation , our hotel Marina**** is finally opened! Welcome! The one-kilometre long, glittering white pebble beach in Mošćenička Draga is one of the most beautiful beaches on the Adriatic. Hotel Marina is located at the very beginning of the beach. The hotel area consists beside the Villa Neptun of 3 new-arranged guest villas. The 4 houses are grouped around a Mediterranean hotel garden and are situated in a calm bay, directly at the sea. Nearly everything of the 104 Superior and De-luxe-rooms, Waterfront residences and suites have sea view. Located in the center of Opatija, along the central Opatija beach. 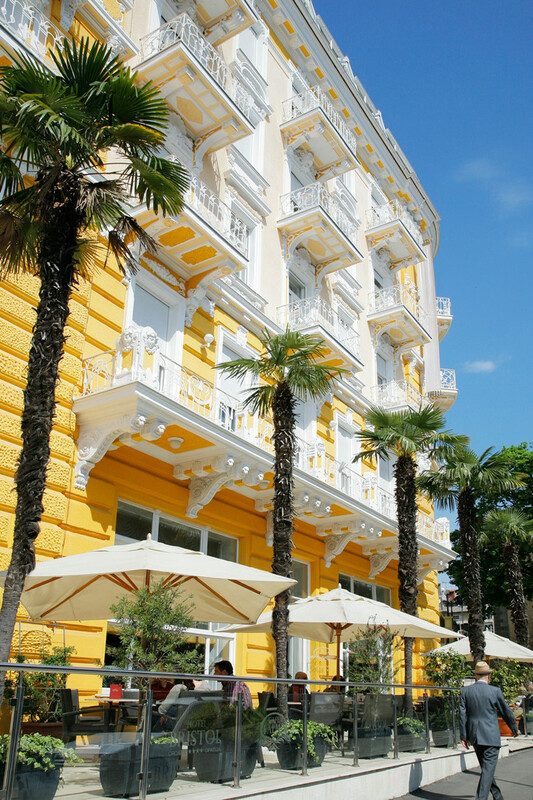 One of the oldest and most beautiful hotels of the Opatija Riviera. Hotel Park Lovran is situated just under the mountain Učka in the same center of one of the most beautiful cities of the Kvarner bay – Lovran. Surounded wih a city center, and famous promenade Lungo mare, Hotel Park invites You for a unforgetable Kvarner experience. Savoy Hotel was completely renovated by July of 2004, and therefore it was categorized as a 4 star hotel. The reconstruction of Savoy was being closely monitored by the Croatian Ministry of Culture due to the fact that it is considered to be a very important cultural monument. The new built Villa Slavica is situated in the centre of Ičići, near the marina and just 150m away from the beach. The beach has a blue flag, because of its crystal clear water and environment, it is also the biggest beach at the Riviera of Opatija. This very beach offers many interesting things for its guests: beach volleyball, parasailing, coffee bars, restaurants, playgrounds for children. Those guests who want to spend a more active holiday will find the following very interesting: tennis court, sailing, diving and surfing are just a few of the water sports, which you can enjoy in Ičići. This newly refurbished villa presents the ideal location for family holidays. Situated close to the 5-star Hotel Ambasador, and connecting directly to it, the villa offers its guests full use of the hotel’s amenities, created for complete relaxation. Its comfortable interior provides first-class comfort and imbues it with a cozy and intimate atmosphere which makes it not only an oasis for recharging one's batteries but a haven where one can pass the time enjoying its amenities. Beauty is in the details. Opatija Riviera as it simultaneously confirms and refutes this claim. The stunning panorama of Učka and endless blue sea between which lies a series of coastal resorts, delight and a series of extraordinary details as well as a single entity. Just like the myriad of perfect crystals that form the gem - both small and great, but certainly unique. One of the most beautiful thing for sure is to discover certain details that make a perfect whole. Hotel Villa Kapetanović located above the picturesque Volosko is right place for such a search. We've made a little hedonistic oasis. Pleasant surroundings and service that will pamper you with a spectacular view of our terrace on the Kvarner islands will remain unforgettable in your memory. Hotel Villa Vera is located in the heart of Lovran, near the beach, the sea, a beautiful park, a 12 km long coastal promenade. Lovran is located on the well-known Opatija Riviera and it became a prestigious destination with its magnificent villas, city's core from The Middle Ages, green Učka Mountain and as well as with its abundance of Mediterranean vegetation. The hotel has lovely garden and private parking. Villa Klara is a family hotel, situated in the calm town of Ičići, surrounded by vegetation and only 150 meters from the main beach. We distinguish ourselves by striving to fullfill the most detailed wishes of our customers with the best features and offers. Our long-term experience in tourism is our guarantee and the results are the many praises that come from our satisfied customers. Our wish is to showcase our offer and help you decide in becoming a satisfied guest of the Villa Klara Family Hotel. On Lovran's very own promenade by the sea, with its stylish facade and mysterious greenery, the hotel "Bristol" encourages a paceful and relaxing holiday. The Hotel Continental is the oldest hotel in the area of Rijeka still in business. It was built as early as in 1888 when its long history begun first under the name “Kontinental”, and later as Continental, the name it has today. The position of the hotel, located in the center of town, is ideal for business people who want to combine holiday and business commitments in the city. It is an excellent choice for visitors who wish to visit the old town. The Galeb Hotel is a small family hotel located in the very centre of the town, right next to the main beach in Opatija. It was completely renovated and reopened in 2000, the idea being to bring the quality of service and accommodation up to the highest levels and to make this hotel an ideal place for a holiday all year round. The second oldest hotel in Opatija, in the center of the town, facing the Opatija park (100 yards from the biggest Opatija beach, 50 yards from the sea). Hotel Lovran is located in two beautiful villas and lies amidst Mediterranean parkland right alongside the sea, keeping many memories of its famous guests. Hotel Lovran today represents a unique holiday venue on the Liburnia Riviera. 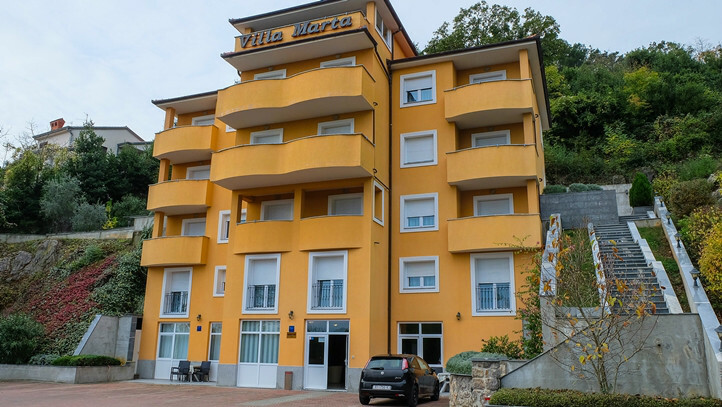 "Villa Marta" is a new building, built 2005 and categorized with 3 stars. Villa has a beautiful view to the sea and it is a very close to the main town beach "Slatina". The Villa consists of 4 floors with 15 apartments. Located in the picturesque little fishing town of Mošćenička Draga, in the close vicinity of the little fishing harbor, the site of summer all-night fishing events and one of the most beautiful pebble beaches on Kvarner. Neboder is part of the complex of the Croatian Cultural Centre ( Hrvatski kulturni dom ) and also its highest segment. The building is 14 floors high and dominates the central part of Rijeka , oriented towards the sea. Due to its position and height of the hotel the view to the entire Kvarner Bay is exposed to the viewer's eye. Starting from the right side and gazing to the left – everything is like on the hand: eastern part of the Istrian peninsula and Učka, Opatija, Rijeka and then, further to the left, towards small towns of Kostrena and Kraljevica and the island of Krk. Villa Palme is a luxury 4 and 3 star apartment complex nestled in the quiet center of Opatija, surrounded with palm trees and other medeteranian vegetation. The Villa is only 350 m from the main beaches and 150 m from the tennis playgrounds. 9-15.7.2012. swimmingpool closed due to routine maintenance. As the Villa Dubrava operates within the framework of Thalassotherapia Opatija, special medical programs are available to its guests, such as cardiology programs, programs for rheumatism, weight-watching program, anti-stress programs, programss for osteoporosis, programs for managers, etc. Room prices includes a free-of charge conslutation with a doctor. 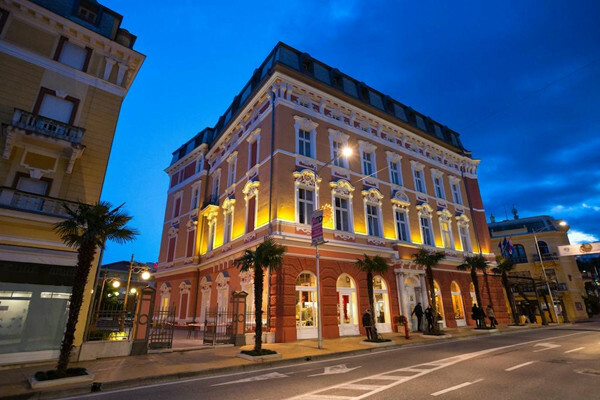 The Hotel Opatija is located in the heart of the Croatian seaside resort of the same name. The hotel, set in a beautiful park-like garden on a hill above the town centre, is just a short walk from Opatija’s famous seaside promenade. Right by the sea, adjacent to the Kristal Hotel and Thalassotherapia Convalescent Center.